I’ve become increasingly aware of two countervailing forces in my paddling life. On one side is the training effort that leads to improvement, on the other is the decline brought about by increasing age. This season it feels like a pretty even match between the two! I raced in 10 slaloms over my first full season in Premier Division, and my two best performances were a 30th place at the Tees Barrage event in October then 35th in British Open B Final at Lee Valley. In both cases I was about 121% of the winner. The most enjoyable weekend was the Bala double-header in October, paddling on a beautiful stretch of natural river. Four clean runs too! I set out to improve my overall Premier ranking, but I didn’t manage to do this, slipping back 3 places to 58. Looking back over my training diary, I averaged 2000 minutes a month from November to March (8 – 10 hours per week), which typically included 2 – 4 whitewater sessions. This was a heavy workload and I probably overdid it at times, getting a bit sore and run-down once or twice. 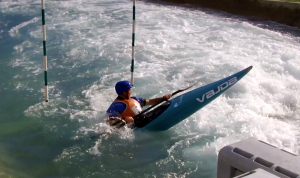 I focused on improving my upstream gate technique, and benefited a lot from coaching and training with Huw Swetnam. The summer (July to September) was brilliant with a couple of family holidays, a trip to Australia, then the world champs were on at my local course Lee Valley. From a training point of view it was less brilliant, and my workload dropped to an average of 1400 minutes each month, with much less time in a slalom boat. My paddling was also impaired by tendonitis in my elbow, which is only now healing. I’m a little disappointed not to have achieved my goal of an improved Premier ranking, and I don’t feel fully satisfied with the overall quality of many of my race runs. In the spring races one error would often lose 4 -5 seconds and spoil an otherwise solid performance. Reflecting on the season with Huw, I lost some momentum over the summer and felt a bit rusty coming into the autumn races. It’s also clear that I’ve not yet consolidated the technical changes around upstream gates so that I can rely on them in a race environment. There’s also time to be found in the downstream sections of courses, by improving my stroke timing to jump stoppers more cleanly. We agreed that an important theme for the winter is to work on maintaining momentum right through the course, and delivering the power I’ve got more efficiently. So I’ve gone back to basics, especially to improve the catch right at the start of my forward stroke. I want to get more precise about where I put the power on and make sure I’m getting the most from every stroke. I’m doing some endurance workouts in my creek boat through November, including 10 lap time trials at Lee Valley (35 minutes and dropping!). I want to get a ranking less than my age, so that means 53 or less in a year’s time. I’m hopeful that if I can train hard and smart I can tip the balance of effort over age and find some improvements!